What’s your Vector Victor? Never gets old. Ever. Finally, a Tom Clancy novel that feels like a Tom Clancy novel, for better and for worse. Plot! – In Threat Vector, the author(s) imagine a world where China has moved aggressively into the South China Sea in an effort to both control the flow of sea traffic and to stake their claim to entire area. To protect their allies in the region, including Taiwan, the U.S. mobilizes, leading the both counties to the brink of war. The novel, however, is not as simple as “we need a bad guy, how about China?” Plausible politics play a role. The president of China is about to be deposed by his own government when China’s military arm swoops in at the last moment to save him. It’s a subtle coup, as the head of the military arm now effectively controls the president. Only the president doesn’t realize just how much he’s being manipulated. As the global situation spins out of control, he finds himself caught in the middle. 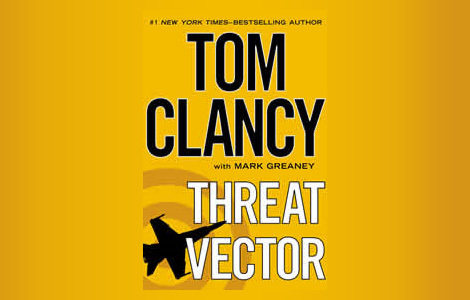 Meanwhile, in the off-the-books organization knows as the Campus, Jack Ryan, Jr. and his band of operatives are hunting down a mysterious hacker responsible for, among other things, turning a military drone against U.S. soldiers. It’s no spoiler to say that the hacker and the Chinese war plan are linked. This is the real plotline of the book: the electronic warfare. And I found it interesting and compelling. Pace! – I think that sums it up. This book has a much better pace than previous installments. It’s still a big book, but it moves along. There is a lot going on and it’s all interesting, all related to the story. Characters! – The characters are drawn better in this novel, including a lone CIA asset in Hong Kong who’s gone radio-silent because of a suspected mole at the CIA (I liked this character a lot). Not that everyone is three-dimensional, don’t kid yourself. But there are interesting character developments going on, such as John Clark trying to figure out how to live outside of the Campus, thanks to age and injuries received in the previous novel. There are even a few surprising events and twists that affect the characters on a personal level. Okay, so what could possibly be bad here? Information Dumps! – I won’t go too much into this, as I’ve railed on it before in thrillers. Just know that it happens here too. Needless Chapters! – I appreciate the author(s) going big and giving a global look at this possible scenario. They try to bring the run up to war to the reader from all angles, fleshing it out from a global perspective. It’s almost an epic. But, in the classic Clancy tradition, there are chapters devoted to secondary characters who don’t have much to do with the plot until the very end when they show up in the plot development for a moment. Specifically, a fighter pilot on an aircraft carrier in the pacific. The way the story is written, though, you don’t actually need to get to know these people. They are ultimately superfluous. The story should mostly revolve around Jack Ryan, Jr. and his team because that’s the meat of it. I thought at least two or three chapters could have been cut. The story would have been tighter, more streamlined and focused. Omnipotent, Omnipresent Bad Guys! – Under the scenarios presented in the book, it almost works. But I thought the god-like powers of the hacking group went overboard one too many times. You know what? Let’s not call this a negative, just a pet peeve. So, that’s really only two negatives, which makes me feel pretty good. I haven’t read any Clancy novels after this one, so I can’t say if they get better or worse. But if you are or were a Clancy fan and you felt the last few novels weren’t doing it for you, I think there’s a good chance you’ll like this one. I did. And you know that my opinion about what you’ll enjoy is, like, super important.